At the turn of the 20th Century, Henry Ford became one of the most successful business men in the world by creating the Model T car and introducing low-cost mass production to auto manufacturing. 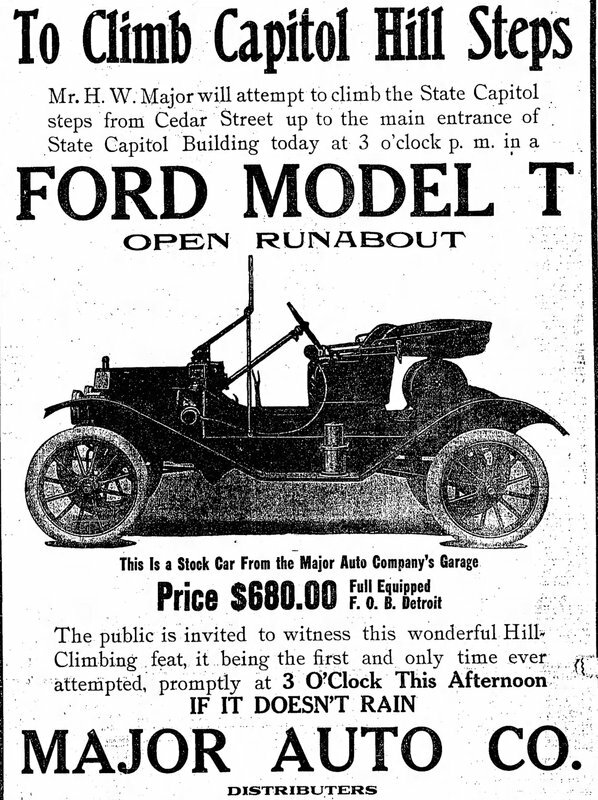 The Ford Company marketed the Model T to the middle class and performed a series of expositions across the country to highlight its motor power. On August 5th, 1911, three years after the Model T went onto the market, H.W. 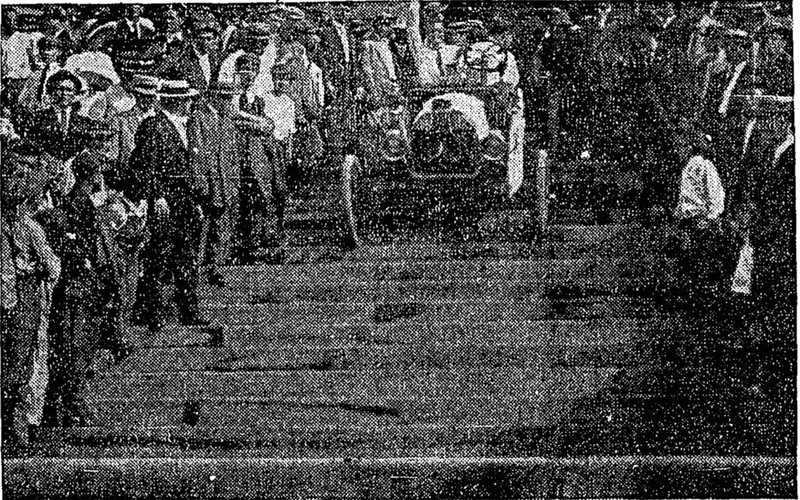 Major of Major Automobiles in Birmingham decided to exhibit the capabilities of the new Ford vehicles by driving up the steps, through the center, and back down the steps of the Tennessee State Capitol Building in a Model T Runabout. He sought to improve sales of the Model T at his dealership. Although based out of Birmingham, Major decided that Nashville would be the best place to show the stunt because its reputation as the “Athens of the South” and the beauty of the State Capitol building. The feat was more complicated than one might imagine. The early Model T had a gravity fed fuel system, so to successfully complete this maneuver, the car had to be driven backwards up the steps initially, turned around as it drove inside of the Capitol Building, and then driven forward back down the steps. Hundreds showed up to witness the stunt. 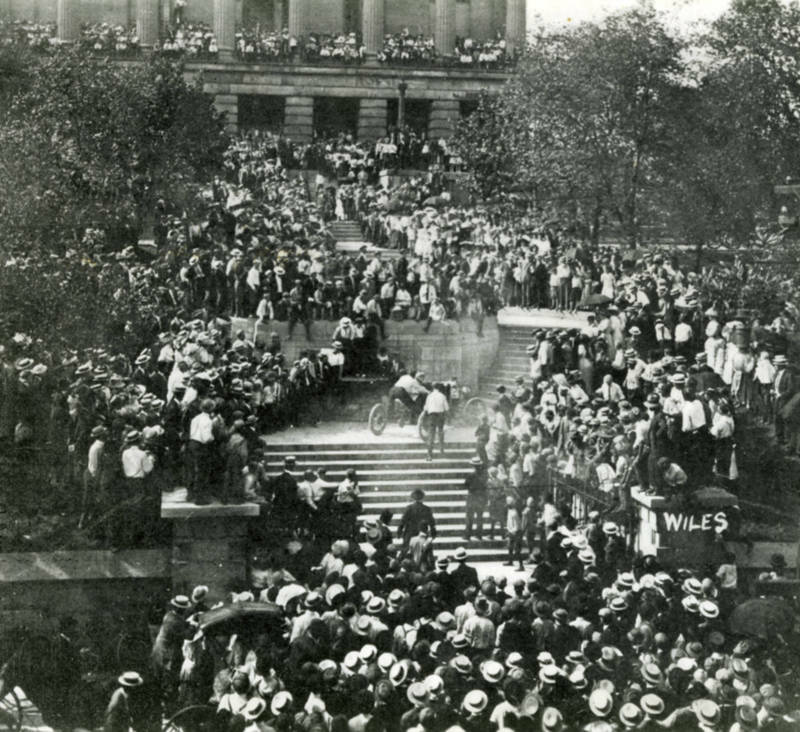 Photos and newspaper articles from the time show that the area around the steps was covered with people with everyone trying to witness the daring accomplishment. The campaign seems to have worked, at least in an advertising sense if not commercially. Papers around the city and state described the events that took place for the next few days. The Tennessean ran at least two stories about the event on August 5th and again, with photos, on August 13th. Periodicals as far away as Pennsylvania ran stories about the stunt, with a column appearing in The Pittsburgh Press on December 10th. Bobby K. Cooley, “Model T exposition at the Tennessee State Capitol Building,” Bygone Nashville, accessed April 25, 2019, https://bygone-nashville.mtsu.edu/items/show/11. Willis, ed. "H.W. 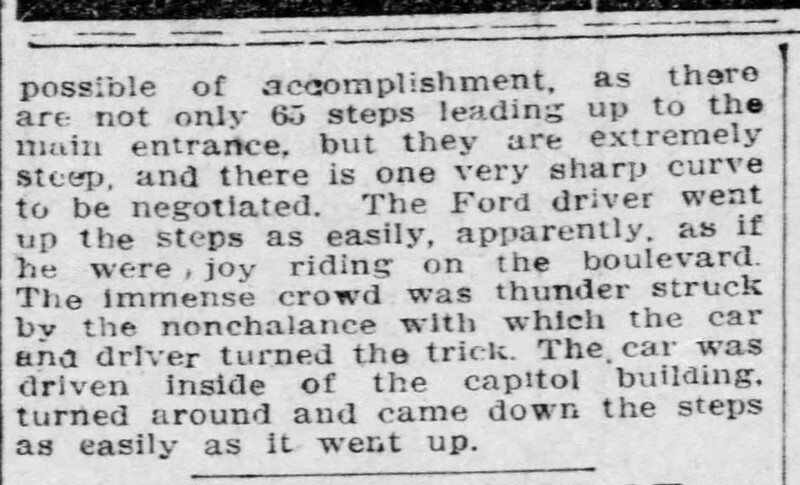 Major of Major Auto Company in Ford Runabout, as He Started the Descent of Capitol Steps After Successfully Climbing Them." The Tennessean (Nashville), August 13, 1911. Accessed November 28, 2017. Major, H. W. "To Climb Capitol Hill Steps." 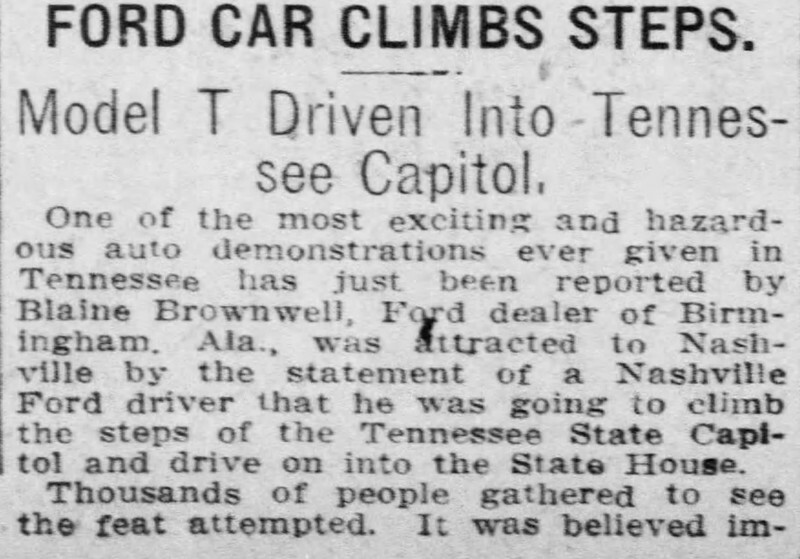 The Tennessean (Nashville), August 5, 1911. Accessed November 28, 2017. "Ford Car Climbs Steps." The Pittsburgh Press, December 10, 1911. Accessed November 28, 2017. Published on Dec 4, 2017. Last updated on Dec 5, 2017.